Drug-induced photosensitivity refers to the development of cutaneous disease as a result of the combined effects of a chemical and light. Exposure to either the chemical or the light alone is not sufficient to induce the disease; however, when photoactivation of the chemical occurs, one or more cutaneous manifestations may arise. 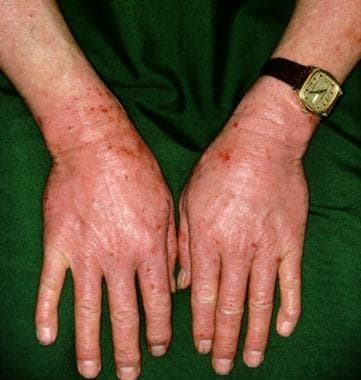 These include phototoxic and photoallergic reactions, a planus lichenoides reaction, pseudoporphyria, and subacute cutaneous lupus erythematosus. Photosensitivity reactions may result from systemic medications and topically applied compounds (see Table 1 below). Wavelengths within the UV-A (320-400 nm) range and, for certain compounds, within the visible range, are more likely to cause drug-induced photosensitivity reactions, although occasionally UV-B (290-320 nm) can also be responsible for such effects. UV-B wavelengths are most efficient at causing sunburn and nonmelanoma skin cancer. In patients who present with photosensitivity, it is often difficult to differentiate phototoxic from photoallergic reactions. However, they have a number of distinguishing characteristics (see Table 2 below). Phototoxic reactions occur because of the damaging effects of light-activated compounds on cell membranes and, in some instances, DNA. By contrast, photoallergic reactions are cell-mediated immune responses to a light-activated compound. Phototoxic reactions develop in most individuals if they are exposed to sufficient amounts of light and drug. Typically, they appear as an exaggerated sunburn response, as shown in the image below. Photoallergic reactions resemble allergic contact dermatitis, with a distribution limited to sun-exposed areas of the body. However, when the reactions are severe or prolonged, they may extend into covered areas of skin. Photoallergic reactions develop in only a minority of individuals exposed to the compound and light; they are less prevalent than phototoxic skin reactions. The amount of drug required to elicit photoallergic reactions is considerably smaller than that required for phototoxic reactions. Moreover, photoallergic reactions, as shown in the image below, are a form of cell-mediated immunity; their onset often is delayed by as long as 24-72 hours after exposure to the drug and light. By contrast, phototoxic responses often occur within minutes or hours of light exposure. Phototoxic reactions result from direct damage to tissue caused by a photoactivated compound. Many compounds have the potential to cause phototoxicity. Most have at least one resonating double bond or an aromatic ring that can absorb radiant energy. Most compounds are activated by wavelengths within the UV-A (320-400 nm) range, although some compounds have a peak absorption within the UV-B or visible range. In most instances, photoactivation of a compound results in the excitation of electrons from the stable singlet state to an excited triplet state. As excited-state electrons return to a more stable configuration, they transfer their energy to oxygen, leading to the formation of reactive oxygen intermediates. Reactive oxygen intermediates such as an oxygen singlet, superoxide anion, and hydrogen peroxide damage cell membranes and DNA. Signal transduction pathways that lead to the production of proinflammatory cytokines and arachidonic acid metabolites are also activated. 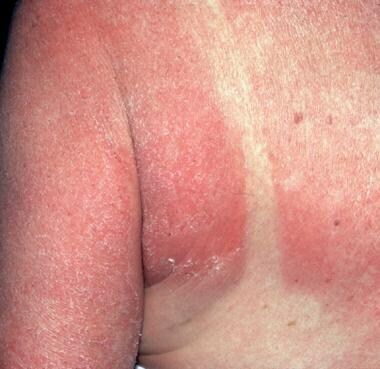 The result is an inflammatory response that has the clinical appearance of an exaggerated sunburn reaction. The exception to this mechanism of drug-induced phototoxicity is psoralen-induced phototoxicity. Psoralens intercalate within DNA, forming monofunctional adducts. Exposure to UV-A radiation produces bifunctional adducts within DNA. Exactly how bifunctional adducts cause photosensitivity is unknown. Photoallergic reactions are cell-mediated immune responses in which the antigen is a light-activated drug. Photoactivation results in the development of a metabolite that can bind to protein carriers in the skin to form a complete antigen. The reaction then proceeds exactly as other cell-mediated immune responses do. Specifically, Langerhans cells and other antigen-presenting cells take up the antigen and then migrate to regional lymph nodes. In those locations, the Langerhans cells present the photoallergen to T lymphocytes that express antigen-specific receptors. The T cells become activated and proliferate, and they return to the site of photoallergen deposition. In the skin, the T cells orchestrate an inflammatory response that usually has an eczematous morphology if the photoallergen is applied topically or the characteristics of a drug eruption if the photoallergen is administered systemically. Most phototoxic reactions result from the systemic administration of drugs. Photoallergic reactions can be caused by either topical or systemic administration of the chemical. Compounds that commonly cause phototoxic and/or photoallergic reactions are listed in Table 1 in Background. The incidence of drug-induced photosensitivity in the United States is uncertain. Phototoxic reactions are considerably more common than photoallergic reactions. The racial incidence of drug-induced photosensitivity reactions is unknown. Photosensitivity reactions can occur in races with heavily pigmented skin. Drug-induced photosensitivity reactions can occur in persons of any age. In most patients, the prognosis is excellent once the offending agent is removed. However, complete resolution of the photosensitivity may take several weeks to months with some compounds. Occasionally, patients have persistent light reactivity for which the prospects for resolution are poor. Drug-induced photosensitivity is associated with death only in rare individuals who are exposed to large amounts of sunlight after taking large doses of psoralens. Although mortality is rare, drug-induced photosensitivity can cause significant morbidity in some individuals, who must severely limit their exposure to natural or artificial light. Voriconazole photosensitivity is associated with a risk of skin cancer. [26, 27] The changes that occur with long-term exposure resemble accelerated photo-aging. Acute photosensitivity occurs in 1–2% or more of patients taking voriconazole for more than 12 weeks. It appears to be UV-A induced, but it is not strictly dose-dependent. Cheilitis and facial erythema are typical initial manifestations. Patients need to be counseled regarding the possible photosensitizing properties of both prescription and nonprescription medications. Most often, appropriate sun protection measures prevent drug-induced photosensitivity reactions. For patient education resources, see the Burns Center, as well as Sunburn.